Now that our animals have had their annual clip, they have transformed overnight from woolly bears to stick insects! But now we need to look after the ultimate product of all our labours - the wonderful soft and lustrous fibre from those beautiful fleeces. Apart from the issues of sorting and grading, we need to get the fleeces as clean and as dry as possible before storage. This requires a sorting table - but where to get something suitable? It needs to be large enough to handle a 2-3Kg fleece, but light enough to move around easily, and not cost too much. It should also store away without taking up room when not needed - for 11 months of the year! We finally combined a couple of ideas we saw in US and Australian magazines, with a few ideas of our own. It's probably not perfect, but it did the job for us. It's made from standard plastic pipe fittings available from any DIY store. The overall size is about 40"x 70", 32" high. 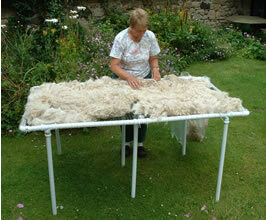 The working area is split into 2 sections to help sort the fleece into blanket and the rest. This also makes it more rigid and provides support for the working area. 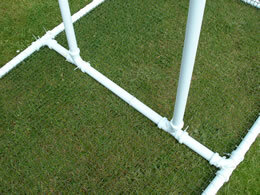 You'll need 12 metres of 1.25" tubing, 4 elbow joints and 8 "T" pieces. Just saw the pipes to length and plug together using the push-fit joints. 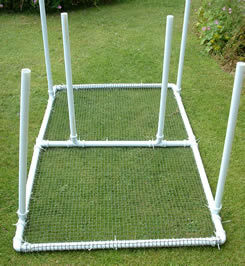 A strip of plastic mesh goes on top, secured with cable ties. 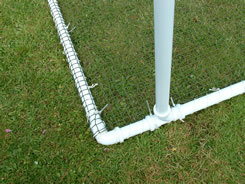 You also could use 2" tubing instead - this is more expensive, but will be more rigid. And if you want a bigger table, this would be the way to go. This lightweight version seems to do the job - and storage is easy. The legs just pull off, so it can just be propped up against a wall. And another tip - we use rolls of "horticultural fleece" from the local garden centre to wrap and store the fleeces. 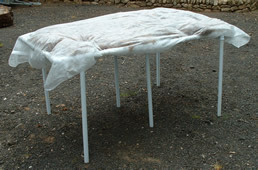 It's strong enough to protect the fleece, but allows it to "breathe", so avoiding moisture build-up. We first place a layer across the top of the fleece on the table, then clip it on with shower curtain clips. They are just the right size for the pipe at the edge of the table. Flip the whole lot upside down, then remove the table. Lay another layer over the top so the fleece is sandwiched, then just fold over the edges and roll up.